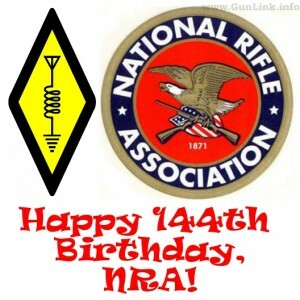 The Yavapai Amateur Radio Club (YARC) of Prescott, AZ, will operate a special event station November 17, 2015, from 10 AM to 7PM EST (1500Z -2400Z) in celebration of the NRA’s 144th birthday. The special event station will operate from Gunsite Academy’s 2,000-acre campus in Paulden, AZ, north of Prescott with a special event call sign will be K7NRA. Operations will be conducted on 7.250, 14.040, 14.250 and 21.335 MHz. All amateur stations, especially those operated by NRA members and Gunsite alumni, are urged to participate. Click here to sign up or renew your NRA membership today and save $10 on dues. A special certificate will be awarded to those stations making contact during the event. 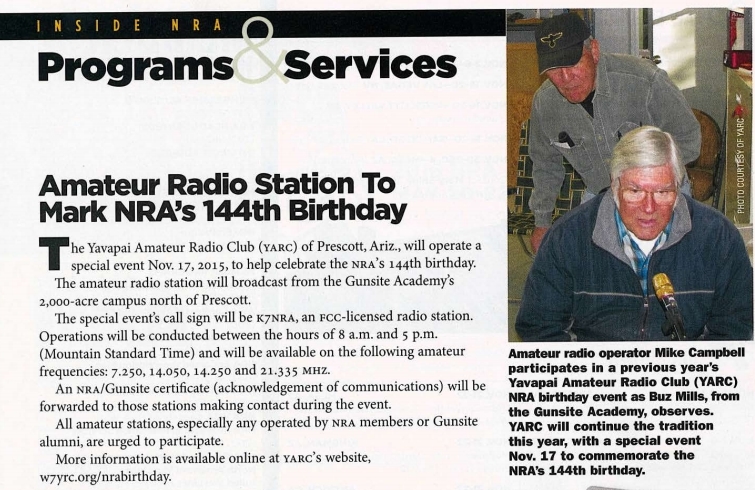 Additional details and QSL information is available on the YARC event page and on p92 of the November issue of American Rifleman.